Find out which is the best vacuum cleaner bag for your vacuum cleaner. With just 4 clicks find tailored to your needs bag. Der Tonnenstrumpf besteht aus einer hoch-wertigen und witterungsbeständigen PVC-Plane, die längsseitig Ösen enthält, mit derer Sie die Plane mit Kabelbindern problemlos an der Mülltonne befestigen können. Find your vacuum cleaner bag in just two steps! 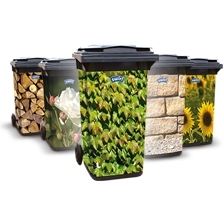 Swirl® eco-film waste bags with handles keep your hands clean while removing the mostly moist waste from the kitchen. Due to the tearproof film and the waterproof properties of the liners, the way to the waste container will become easy and clean. The liners are made of 100% compostable film and thus degrade within a few weeks. Disposing of organic waste is a clean business with Swirl® organic eco-film bags. Swirl® organic waste-paper bags are naturally gentle on the environment.